The Department of Logic at Eötvös University began its existence in the 1970s as a group of philosophy faculty members working in the field of symbolic logic and methodology of science. The founder and central figure of the group was one of the leading Hungarian logicians, Professor Imre Ruzsa. As a separate unit, the Department was established in 1982. 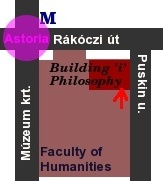 It belongs to the Institute of Philosophy of the Faculty of Humanities. The Department of Logic enjoys strong cooperative relations with the other philosophy departments of the university and with several science departments, including mathematics, physics, and theoretical linguistics. It also has strong connections with the Algebraic Logic Group of Rényi Institute of Mathematics. The Department organizes and hosts two weekly seminars: the Theoretical Philosophy Forum and the Logic and Philosophy of Mathematics seminar. The courses taught before 2014 are archived here.